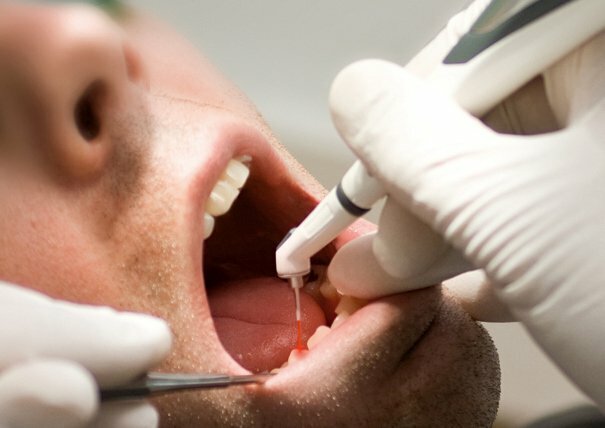 DIAGNOdent laser cavity screening is a way for your dentist to find even the smallest areas of tooth decay and cavities. By using the advanced DIAGNOdent technology, we are able to treat small cavities and areas of tooth decay before they become larger issues requiring multiple procedures. DIAGNOdent is a quick, comfortable process that helps you and your doctor keep your smile healthy and happy for a lifetime. DIAGNOdent uses a precise laser scanning system to scan over all of your teeth while sending out an audio signal and registering a digital readout. By measuring the fluorescence within each tooth’s structure, Dr. Massner can identify where there may be cavities developing in the small spaces between, on, and around your teeth. DIAGNOdent is comfortable and takes only a few short minutes to scan your entire mouth for cavities and decay. Detecting tooth decay as early as possible helps eliminate the number of costly treatments that you may need down the line and helps treat small problems before they become serious dental cases. Most tooth decay begins in the tiny cracks and grooves of your tooth’s surface. By the time the cavities are noticed, it’s often because there is a much larger problem, and the cavity itself was never seen or felt by the patient. With the widespread use of fluoride, many of these cavities never make it to the tooth’s surface, and instead, begin eating away at the tooth from the inside out. The DIAGNOdent laser helps locate these small areas of decay.